Bumping- the criminal bumps into the rear of the victim’s car and when the victim gets out, the criminal jumps in the victim’s car and drives off. Fake injury- the victim stops to give help to an “injured person” only to have his car stolen when he gets out. Fake car problem- the victim stops to help another car only to have their car stolen. At a red light, stop sign, or gate- once the victim stopped, the criminal pulls the victim from the car and jumps in. (3) The taking was with the intent to temporarily or permanently deprive the victim of his right to the motor vehicle or any benefit from it. Assault is an intentional and unlawful threat, verbal or by action, to do violence to a victim, it reasonably appears the person has the ability to carry out the threat, and the act creates in the mind of the victim a well-founded fear that violence is about to take place. The standard for fear in assault is the reasonable person because not everyone gets scared when they are threatened with violence or when a gun is pointed at them. See Smithson v. State. For example, if a person stuck a gun in Chuck Norris’ face, Chuck wouldn’t be scared and there wouldn’t be a carjacking, but a funeral for the would-be carjacker. The carjacking has to be intended and not some type of afterthought. See DeJesus v. State. For example, an ex-boyfriend could want to beat up his ex-girlfriend’s new boyfriend by pulling him out of the car and beating him up, and then coming up with the afterthought of driving his car off into the lake, but he could not be charged with carjacking. A deadly weapon is a weapon used or threatened to be used in a way that will cause death or great bodily harm. A firearm is what we commonly call a gun. 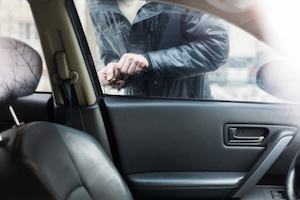 Carjacking without a weapon is ranked level 7 out of 10 on the Florida Criminal Punishment Code and is a first-degree felony punishable up to 30 years in prison and a $10,000 fine. Carjacking with a weapon is ranked level 9 out of 10 on the Florida Punishment Code and is a first-degree felony punishable up to life in prison and a $10,000 fine. There is a minimum mandatory prison sentence for just carrying a firearm during a carjacking and 20 year minimum year minimum mandatory sentence for pulling the firearm out under Florida’s 10-20-Life rule. If a person is injured or killed, there is a minimum sentence of 25 years in prison up to life. Carjacking is an extremely serious crime. Law enforcement will be aggressively working on the case. You will need aggressive and professional attorneys helping you defend your case. Our law firm focuses on criminal matters. We have experience in dealing with criminal cases all the way to trial. If you have been arrested and charged with this crime, call our law offices today so we can schedule a free consultation. We want to talk to you about your version of the events. It is important for you tell us everything so we can help create a defense strategy for you. We will try to persuade the prosecutor to drop your case. If the prosecutor is not persuaded, we can take the case all the way to trial and argue for your acquittal. Call today so we can get to work helping you!